http://ff-squad.com/tech/sensors/ckf.jpg (d-series shown). 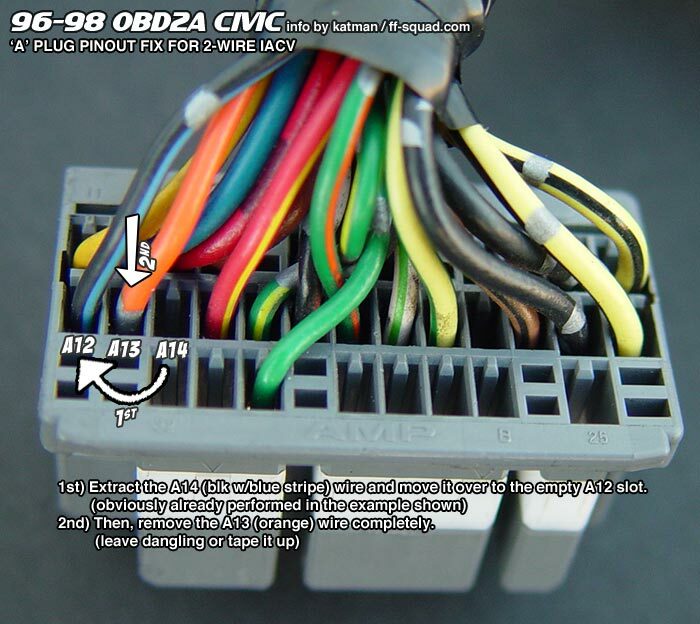 OBD2 B-series is in the same location but is a 2-wire sensor. All you need to do is color match the 2-wires a B-series CKF sensor uses and disregard the 3rd wire (off your harness). I’m not 100% sure if the CKF trick is causing ignition timing fluctuations. This is actually the first time someone has reported this to me. I mean, I could see how it could possibly affect ignition timing but a couple tests would need to be performed to single out if the CKF trick is actually causing this problem. Damn. No problem, but, the test would need to be performed on a car equipped with a working CKF sensor. 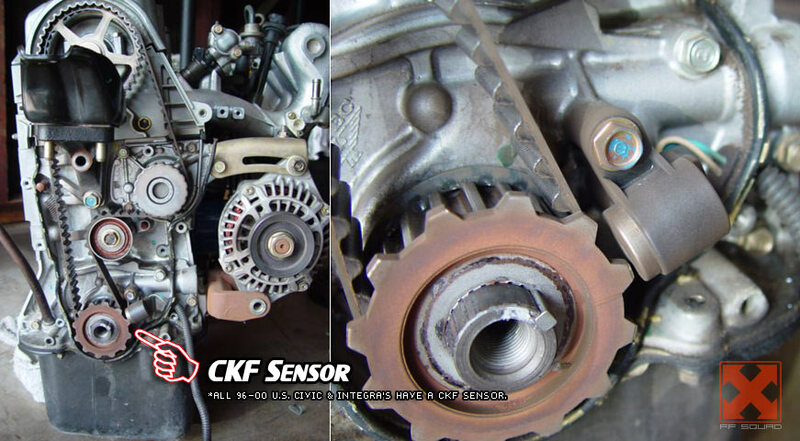 The test would consist of monitoring ignition timing while the vehicle is running and CKF sensor plugged in and the second test would be to monitor ignition timing while the vehicle is running w/CKF trick in place. lol, yeah that is an obvious way to do it. I guess I just interpreted your response in meaning tests could be done on my system with the idle timing problem to determine if the CKF trick did it. maybe you can ask such a question for someone to do this test in the main CKF article? Does he need to trick CKF ? And what about IACV does it need to re pin? If that’s a true JDM B18B non-VTEC DOHC engine, there shouldn’t be a CKF sensor on the oil pump (JDM engines don’t run a CKF sensor on the oil pump like US OBD2 motors do). Regardless, if your B18B engine DOES have a CKF on the oil pump, you need a 2-wire CKF plug from an OBD2 integra or 99-00 Si. 96-00 SOHC Civics all use a 3-wire CKF plug which needs to be switched out if going US OBD2 B-series. Whoever told you to run a P72 ecu is an idiot. You have the correct non-VTEC ECU (P75) to power your B18B engine. P72 is a GSR (B-series VTEC) ECU which would throw a check engine light for VTEC components you do not have on your B18B engine. Just color match the CKF wires from the integra harness to your civic harness and use the wires that match. If only one of them matches, use that one, then test the other two, whichever of the extra two wires work out…there you have it. If this doesn’t work for you, then perform the CKF trick as my article above explains. yes you will need to perform the CKF trick in order for the OBD2b ecu to not throw a CEL 54.
so the car should start up if i do that then? it not turning on atm. Nevermind i think you have the the fix in red backwards. i depinned the c1 and c11 wires from the ecu, but then where does the CKF port on the ecu get its reading? no where. you need to cut the wiring AFTER the splice on the wiring side, NOT at the ECU side. so after you splice it together, c1 and c4 will be tied together with c1 cut AFTER the splice on the other side of the harness going towards the engine bay. same with c11 and c14, worked like a charm once i reversed the wiring. Yo Katman. I got my b18b started and it is an obd2 US MOTOR but im haveing a problem since the crank sensor wires where broken and i tried to color match the wires i get check engine light and when i plug my scan tool up it say cylinder sensor my question is what should i do to get that code off (code1383) and will i pass emissions? what should i do dude car runs like a champ new headers, blox im, password jdm intake, itr TB car is amazing but still cant figure out why the code if i performed the trick . katman i just performed the ckf bypass both ways on a jdm b18b1, and i’m now getting p1337 code. “csf sensor no signal” have you had any one else run into this problem and if so what should i do? soooo should i hack up the wires or just leave them does this trick even work????? Please re-read article as it has been updated as of today. Yes, only if you’re using a non-VTEC engine wire harness. YES, CKF trick is required. Thank you for pointing this information out! Because of you, I have updated this article – thanks Will! Yes you do. Please re-read article as it has been updated as of today. Please re-read article as it has been updated as of today. Thanks. katman pls tell me if this trick will work..
Hey I have a 97 accord and I put a 94 bottom end on the stock motor a had in it..
so I have the OBD2a head, wiring harness and ECU but the OBD1 block so I dont have a CKF sensers on it.. It wont start and im pretty sure thats the poblem do you think your trick thing would work for me?? and if so would the wires be the same as the diagram you have for the civic ecu?? Katman, I have a problem with my stock 99 civic si popping CKF sensors… will this fix that and bypass the sensor and allow the car to run properly? Right now it keeps throwing a P0366 and will not rev past 3500rpm. So i did the trick and the light gos off after the car has been turned off for a few mins but after a couple secs after i start it the light comes back on. ive done it both ways. but i cut the wire before connecting it to the other wires, is that wrong? should i keep the connection splice then cut the wires or dose it not make a difference? I HAVE PR3 OBDO AND A P2P 98 CAN I USE 98 ? Hi, I need to pass emissions next month and just realized my wire harness does NOT have the plug for the sensor, eventhough I have the sensor I cannot plug it anywhere, can I still do this trick? Mario, the PR3 OBD0 ecu will not work for your swap. I highly suggest converting to OBD1 if you don’t want to touch the CKF sensor at all. If you’re use the P2P ecu and the B16A engine is OBD1 or older, then yes, you need to perform the CKF bypass trick. So no plug, but you do have the CKF wiring dangling by the crank pulley I assume? Regardless, you should still be able to perform the bypass trick since the mod is all done at the ECU plugs. Go for it and tell us what happens. Are you looking at ecu pinouts C11 & C14 the correct way? You should have these pin outs otherwise the car won’t even run right. Yes this is the trick you want to do for your type of engine swap scenario. I believe accords have more wiring at the CKF vs. civics/integra’s do. I haven’t tried performing the CKF trick on an accord/prelude platform. I haven’t researched this so I can’t give you an answer at this time..sorry..
You should cut the wires as mentioned in the article. did you cut the wires as explained in the article? and yes i cut c1 and c11, and i was thinking if there is no sensor at all why do we not the c4 or c14?